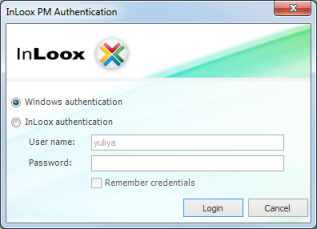 Choose between Windows Authentication and InLoox PM Authentication to logon to InLoox PM 8. In Outlook 2007, click InLoox PM Folder in the InLoox PM Toolbar and then Log on as. How to log on with an existing InLoox PM 8 user account • Copyright 1999-2019 © InLoox, Inc. All rights reserved.